Although I've yet to try a YSL mascara I've certainly heard good things, especially about YSL Babydoll which seems to be constantly raved about. So what makes the new YSL luxurious mascara stand out? Apparently it's all in the triple film complex which remains unchanged from the previous version. There's a coating film for intensity, a conditioning film for curve (a must have for my short straight eyelashes) and a fixing film for long lasting effectiveness (something else I always look for as I hate mascaras which smudge or flake during the day). What's new is the addition of 4 sensuous oils which helps to leave the lashes more flexible, lengthened and supple. I'm also intrigued about the brush applicator which has nylon fibres of different diameters to help enhance volume. To go along with the relaunch there's an attention grabbing video campaign featuring model of the moment Cara Delevigne - anyone else wish they had her perfectly groomed eyebrows and long flowing locks?! Of course with any mascara the proofs in the testing but YSL luxurious mascara certainly sounds very impressive and I know I'll definitely be giving it a try next time I go shopping! Have you tried any of the YSL mascaras? What are your eye make up favourites? How the afternoon tea is usually served up. plates along with some tasty extra extras too. savoury batter, these were so moreish! wrapped up in soft pastry and gently steamed. 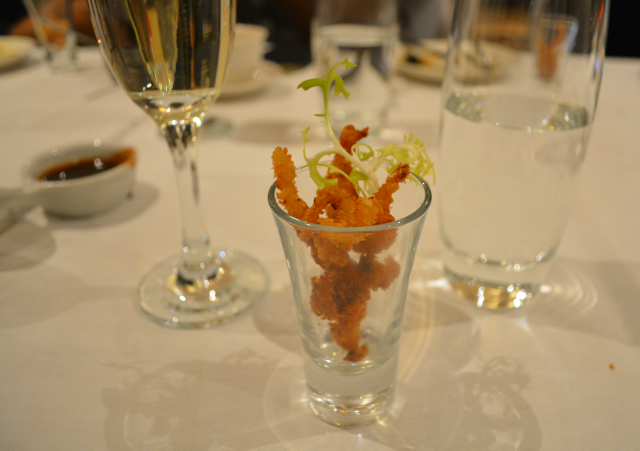 the crispness of the prawn and cut through the richness perfectly. 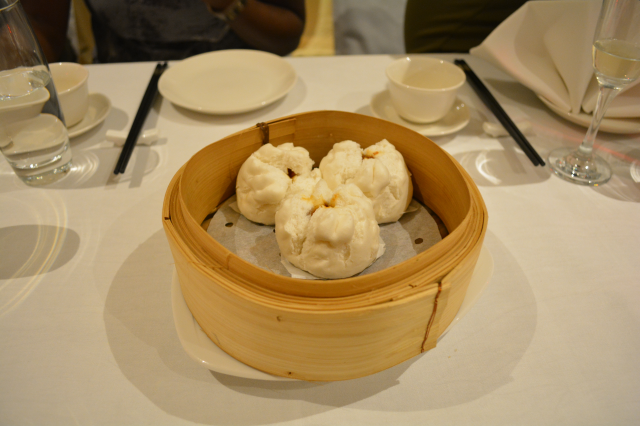 BBQ pork (Char Sui) bun - Another dim sum classic. Sweet marinated pieces of pork enclosed in a light fluffy bun. 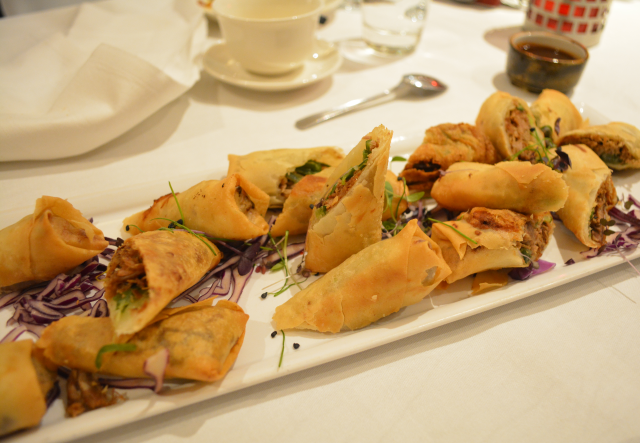 These ones always go down a treat whenever we go for dim sum. this one but it certainly looked interesting! traditional Peking duck pancakes too (not pictured). great to have some fresh fruit to nibble on too. 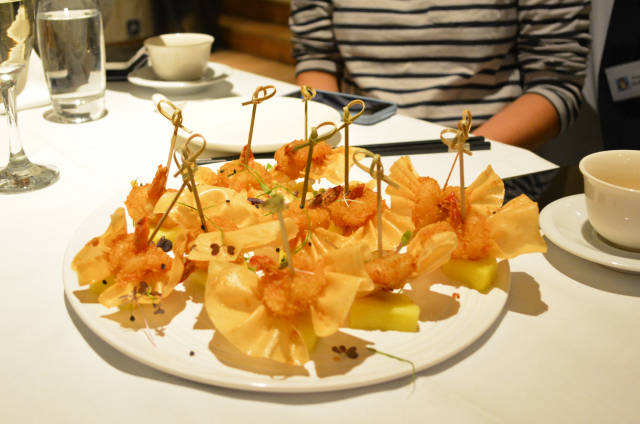 As someone who eats dim sum regularly (and therefore like to think of myself as a bit of a connoisseur) I had very high expectations and I'm pleased to say that Le Chinois did not disappoint. 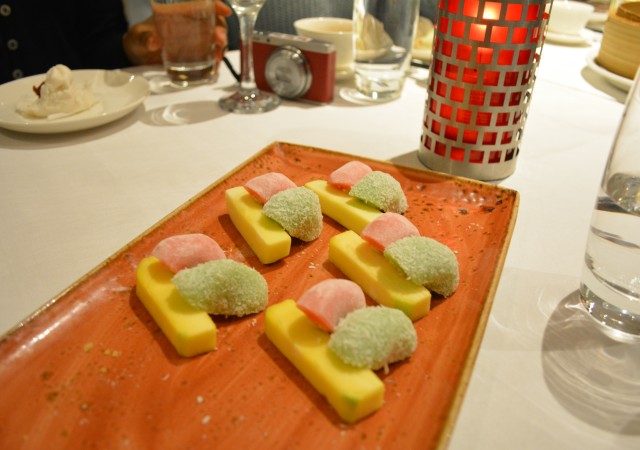 The restaurant is run by authentically trained head chef Anthony Kong and although some of the dishes aren't what you'd traditionally associate with dim sum the flavours were absolutely spot on and each dish more delicious than the last. 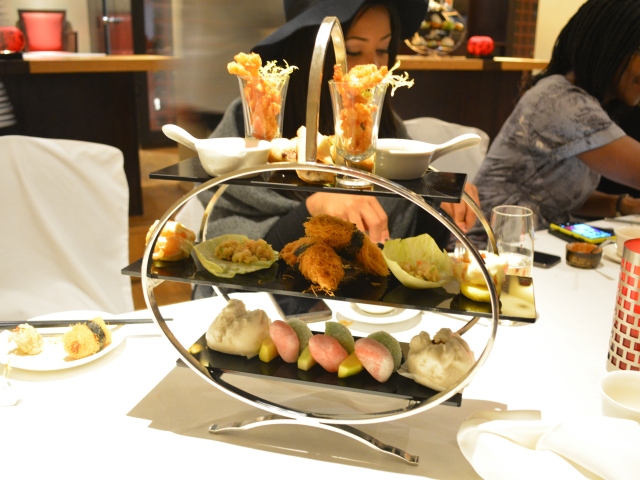 I still love my cheap and cheerful restaurants but for a special occasion (such as Chinese New Year) this would be a great alternative to the traditional afternoon tea and I would love to return for my birthday later this year. 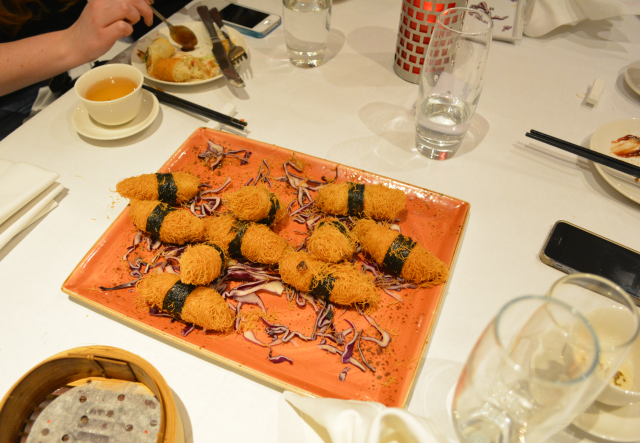 Le Chinois dim sum afternoon tea, £25 per person (12-5pm daily). 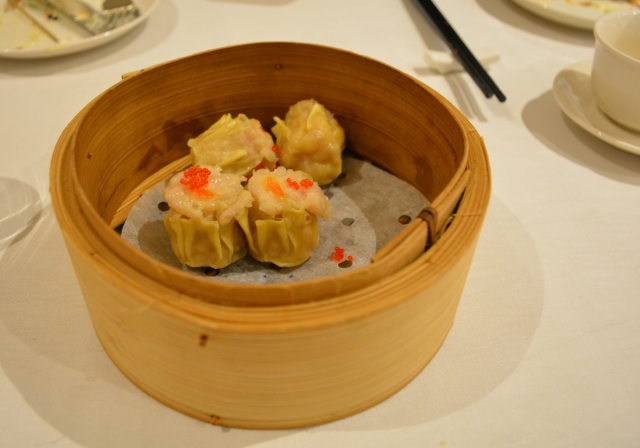 Have you ever tried dim sum? 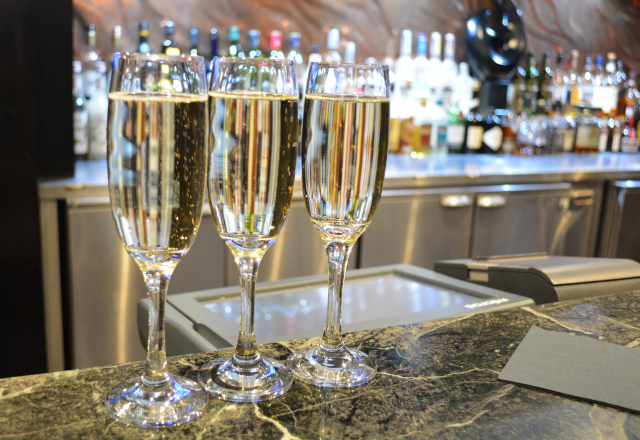 What are your favourite special occasion restaurants? 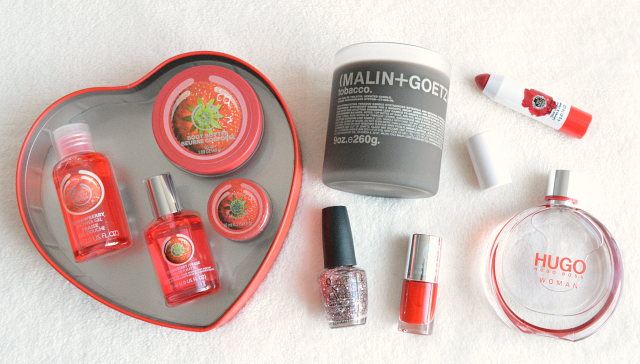 Whenever I can I always like to start with a mini pamper and just before Valentine's I was kindy sent this heart shaped strawberry gift set from The Body Shop. 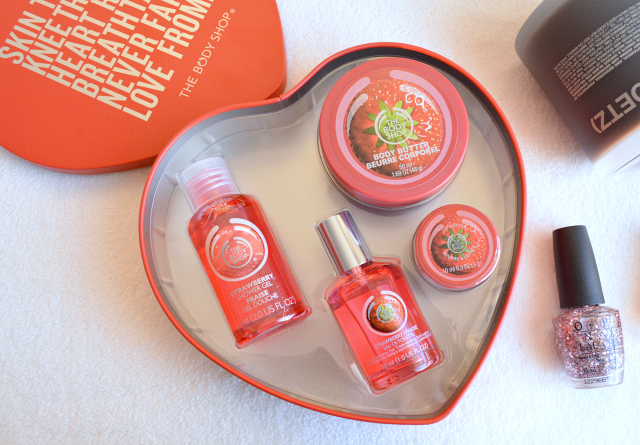 As I had my own perfume I didn't use the EDT, but the shower gel, body butter and lip balm made for a lovely trio. The scent reminds me of those strawberries and cream sweets and smells good enough to eat! Plus the formula is really moisturising and helped to keep my skin soft and smooth all day long. 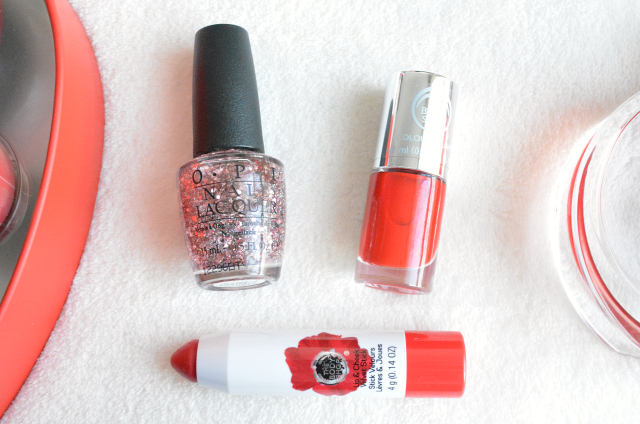 I'm not normally a red lips and nails kinda girl, but if you can't wear red on Valentine's day then when can you? I think lip crayons have to be one of my favourite formulas and I really liked the new Body Shop lip & cheek velvet stick in No 40. It's a flattering berry red shade which gives a sheer wash of colour whilst at the same time still being nice and moisturising on the lips. For nails I decided to go for Relish the moment, an almost identical red which looked really pretty when paired with my favourite OPI pink yet lavender glitter. It's always nice to have a candle flickering in the background but I actually surprised myself with this tobacco scent from Malin + Goetz. Normally I can't stand anything tobacco related but this is rather sweet and almost reminds me of dark chocolate. Of course there are notes of leather and smoke too. A really beautiful winter scent which I'm now obsessed with and can't stop smelling! Finally for perfume I decided to go for the new Hugo Woman by Hugo Boss. I found the bottle quite plain and clunky which is a shame as the actual fragrance is lovely. 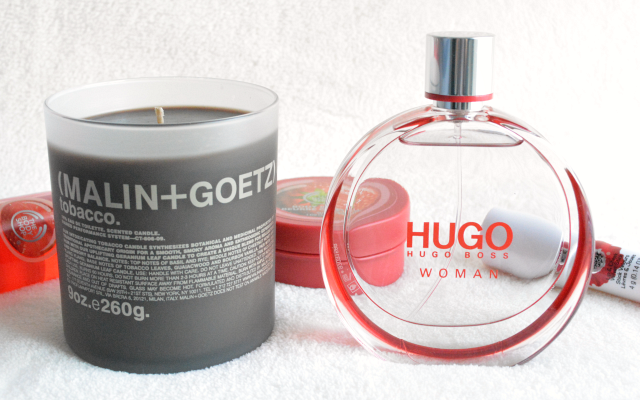 With notes of boysenberry, mandarin, plum, tea and sandalwood it's bold and feminine. Perfect as a date night perfume and it'll work really well as a transitional scent too. Although the notes are very different it reminds me a lot of Boss Orange, one of my signature scents and I can see this fast becoming a new favourite too. Did you have a nice Valentine's weekend? 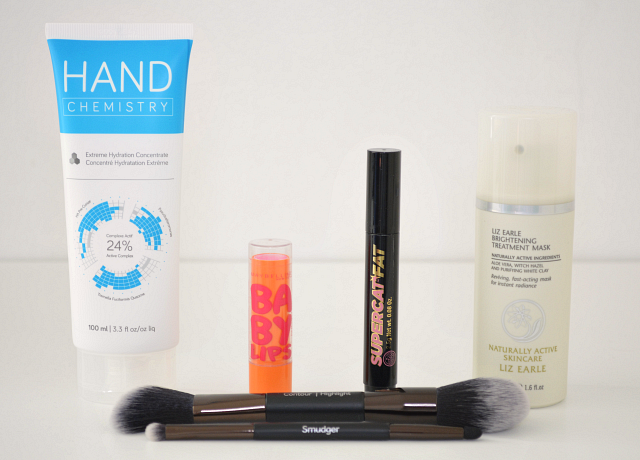 What are some of your beauty favourites? Thanks to a combination of time away from home and The Body Shop Christmas advent calendar I managed to get through quite a few travel sizes this month. The mini shower gels and body lotions are so handy and I'm glad I've now got a stock pile for any trips away later this year. With the weather taking a turn for the worse I've managed to finish several of my favourite moisturisers and need to restock asap! Elemis pro collagen marine cream in particular is great for this time of year and I liked that it was both protecting and anti-ageing. Ragdale hall spa body butter was another favourite which smelt and felt far more luxurious than its £8.50 price tag. As always there's a can of dry shampoo and although I've tried most of their varieties, Batiste brunette remains my favourite, simply because its so quick and easy to rub in and doesn't leave behind a tell tale white cast in my hair. Another product I really enjoyed using was Organic Surge spiced lily bath foam (although I used it as a shower gel instead). I don't think their products get enough credit and considering it was SLS free I had no problems getting a decent lather. Plus I loved the warming combination of patchouli and clove bud. 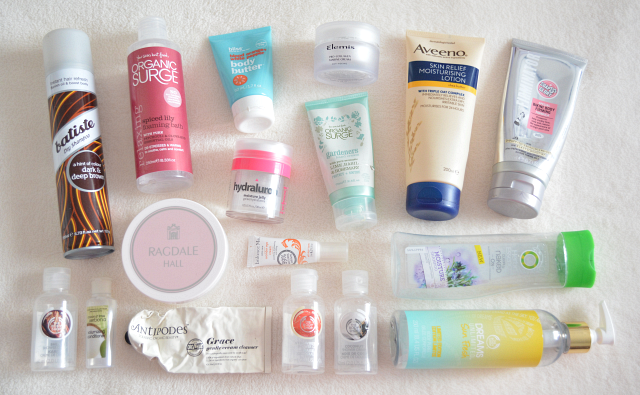 These days I tend to give away anything I dislike so it's rare to find them in my empties however there are always a couple of products which I probably won't repurchase again. This month it would have to be Antipodes Grace gentle cream cleanser and The Body Shop dreams unlimited sun fresh body lotion. Both nice products but especially this time of year I find myself gravitating towards balm cleansers and rich body butters instead. How did you get in December/January? 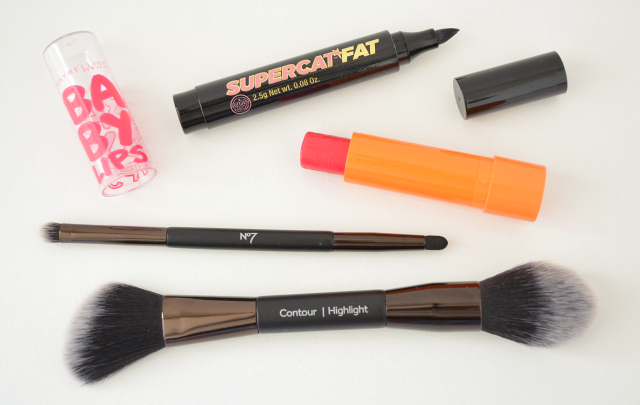 What were your beauty favourites? Browsing the Wahanda website I was spoilt for choice with locations and treatments all around London - in fact it took a good day or so for me to eventually decide. 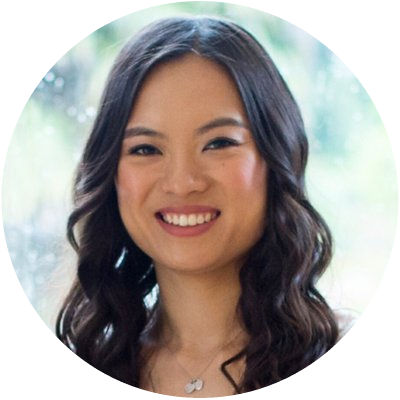 Normally I'd go for a simple back, neck and shoulder massage but in the spirit of trying something new, I thought I'd give the hot stone massage at Blue Harbour health club and spa a try. It also helped that the spa was conveniently located in Chelsea right next to where I was meeting a friend that day! On arrival I was greeted by the friendly reception staff, given a quick questionnaire before being taken on a tour and shown to the changing rooms. It turns out the pool and sauna are open to all guests and bath robes, slippers and towels are provided for everyone, although I was disappointed to find my robe had the tie missing. Upstairs there's a lounge area with drinks and magazines provided where you can relax before and after your treatment. It's also where all guests are greeted by their therapist. Like all good treatments, mine started with a quick chat about what it would involve and an assessment by the therapist to see which areas needed the most work. Turns out I naturally position one shoulder higher than other and one foot out in front - a sign perhaps of the stress I've recently been under. For the treatment you are given some hot stones to lie on which I thought was a great way to start and I loved the warming sensation as the therapist used more hot stones to massage in the body oil. Compared to a traditional massage it doesn't relieve as much tension but if you just want something relaxing then this would be a good choice. Towards the end there's the option of using cold stones to invigorate and boost circulation. I'm glad I gave it a go but safe to say I'll be sticking to just the hot stones in the future! Afterwards there's no rush to leave and I took full advantage of the lounge area, sipping on tea and reading magazines (plus occasionally sneaking a look on my phone). Having been to some amazing places over the years Blue Harbour feels more like a health club than luxury spa, however that's reflected in their price and I couldn't fault my treatment or the friendliness of it's staff. If you're after the full spa experience I'd recommend Lifehouse or Baglioni spa but if you're after a no frills treatment in a convenient location then I'd recommend giving Blue Harbour a try. Have you tried a hot stone massage before? 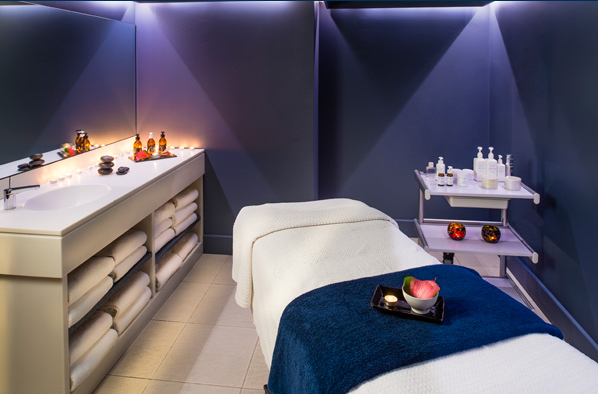 What are your favourite London spas?